Badgers are several species of medium-sized mustelid carnivores, the Eurasian badger (Meles meles), the North American badger, both grey with striped black and white heads, and the Honey badger or Ratel of Africa. Badgers are carnivorous upon various small animals such as rodents, moles and hedgehogs. They live in elaborate underground burrow complexes called setts. In the United Kingdom badgers are commonly blamed by farmers for spreading bovine tuberculosis, although the disease is generally spread by uncontrolled livestock movements. Nevertheless, the current Conservative government has given culling licences and a programme of culling has begun. Badger hairs were sought after for making shaving-brushes, a practise that has ceased in many parts of the world due to the dwindling badger population. Badger hair shaving brushes now have something of an heirloom quality about them as commercially farming and shaving badgers has failed because they are not social animals and tend to aggression when in captivity. Badger is one of the main characters in The Wind in the Willows. The dire badger is a fictional variety, larger, more savage, and sometimes more intelligent, occasionally encountered in role-playing games. 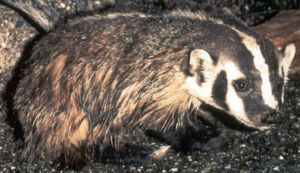 The badger is the state animal of Wisconsin and the mascot of the University of Wisconsin. This page was last modified on 2 April 2019, at 00:58.